We love the Smoky Mountains. Wish you were here! You may associate southern Appalachia with square dancing and clogging, but another dance form is alive and well — bellydancing. 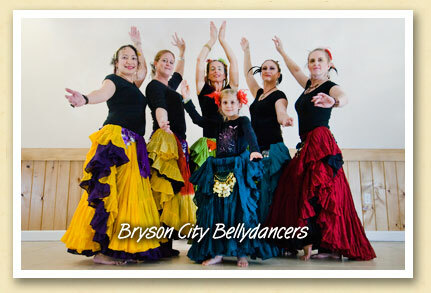 Recently, the newly-formed ‘Bryson City Bellydance‘ organization invited the community to a dance party, or “Hafla”, where dancers from Waynesville, Morganton and Bryson City performed different styles of bellydance. The Bryson City Bellydancers above are (l-r) Raquel Moore, Kim Holt, Diane Cutler, Tayla Holt, Sarah Miller, Paige Christie. The group is currently offering beginner, intermediate, and cardio-bellydance classes and welcomes anyone interested in joining the performance troupe. Design by Deep Creek Arts, based on fSpring, a theme by Fredrik Fahlstad. Powered by WordPress.